Have you been watching the weather forecasts this winter? I mean, it's freaking cold out there. New York was hit with a thunderous blizzard. The Northwest was seeing abnormally low temperatures. It was snowing in Vegas. Well, with all this cold weather around, it kinda just makes me want to find something warm and cozy to wear, but I need something that expresses my love of motorcycles too. 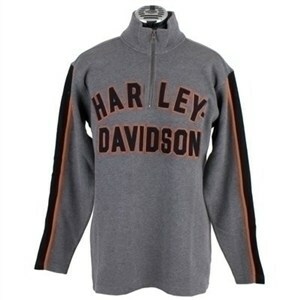 Well, luckily I stumbled across the Harley-Davidson Sleeve Stripe 1/4 Zip Shirt. As far as long sleeve shirts go, this one has all the ingredients to equal warm and toasty. It's 100% heavy cotton (so you need to watch out for shrinkage). The zipper only goes down to the chest, it's a pull-over, but then you don't have to worry about the zipper breaking and then being stuck with a sweatshirt that is always open. The graphics are embroidered in the back and applique on the front, with custom neck tape color block stripe details on the sleeves. It only comes in gray though. It will come in handy because if you're tired of your college football sweater getting buffalo wing stains on it, you can still wear the Harley shirt to the game and your buddies won't say anything.